New Mahindra Mojo colour options coming soon | IAMABIKER - Everything Motorcycle! Mahindra may be the late entrant to the Indian two wheeler market but it certainly is no slouch. The brand was quick to jump into motorsports despite all the time taken to bring out the Mojo. Now that the Mahindra Mojo is in the market and slowly finding its fans, the manufacturer plans to introduce some new colours to offer more options to riders interested in buying the motorcycle. These new colours have been highlighted by the brand in a promotional video they launched for Mahindra Mojo recently. This promotional video, called ‘Born for the Road’, puts light on the target audience for the motorcycle, basically travel enthusiasts. This promo video features a group of Mahindra Mojo riders going places on their motorcycles. 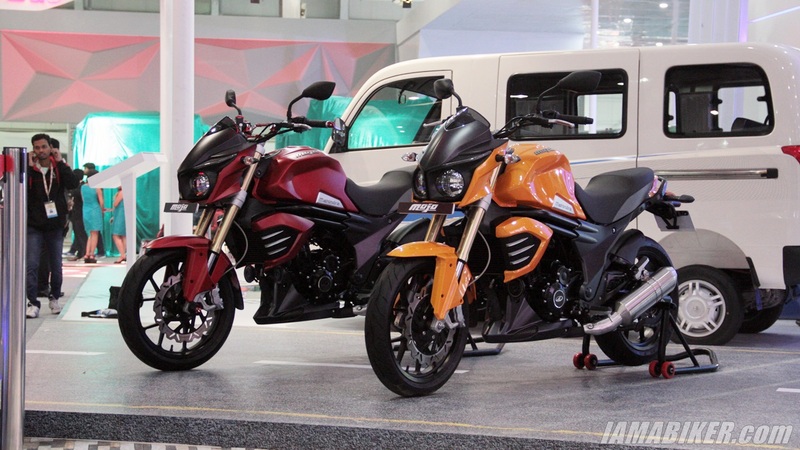 Among these motorcycles, one of them carries the brand new crimson colour with a matte finish. The colour will be rolling out in the market soon. This colour of Mahindra Mojo was first showcased earlier this year at Auto Expo. This will be followed by the introduction of yellow colour scheme for the Mahindra Mojo. This colour was also showcased along with the matte crimson during Auto Expo. The crimson colour on Mahindra Mojo will come with other parts like engine, wheels, side panels and belly pan coated black. The Mahindra Mojo comes with an engine that generates 27 PS of peak power at 8000 RPM and a peak torque of 30 Nm available at a relatively low 5000 RPM. This makes it torquier than the 350cc Royal Enfields which are known for the high amount of torque they generate. The Mahindra Mojo uses top notch equipment and comes with Pirelli Diablo Rosso II tyres on both ends. The motorcycle is tailored for highways and performs quite well over long distances.